Free Games Corner – Where Is 2012? This week in Free Games Corner we end 2011 by asking “Where is 2012?“. Well you really don’t have to wait too long to get the answer to that question in real life, in fact in a few time zones the�answer�is very, very, obvious at this point, but none-the-less that shouldn’t stop you delving into the watercolor�wintry�world of this seasonal game-let from�Pastel Games. 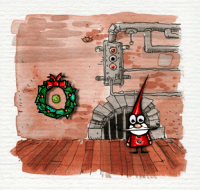 In the game you play the role of a very gnome-esque Santa, searching for that young whipper-snapper 2012.�Use�the cursor keys to move around, and the down cursor key to go through doors, and to interact with items.�As you adventure around the platform based word you are accompanied by some�satisfyingly�atmospheric�musical tinkles as you collect present bonuses, and try to find the hiding place of the missing new year. All in all it makes for a�whimsically�pleasing�way�to see out the old, and bring in the new. Free Games Corner will be back in 2012, once I’ve found it, and in the meantime�you�can�catch�me for more freebies over at Lazylaces. Graeme – who has written 4 posts on The Red Ferret Journal.